It’s a whole new adventure putting up Christmas lights at the new house. Everything’s new and different. Where can I attach things? Where can I plug things in? Where can I put things so they stay dry if it rains? We had some pretty significant rain a couple of days ago, and while we didn’t have to deal with any of the major problems that deluge brought to Southern California (especially to the burn areas), I found myself scrambling on Monday and Tuesday to try to waterproof my Christmas light installations. 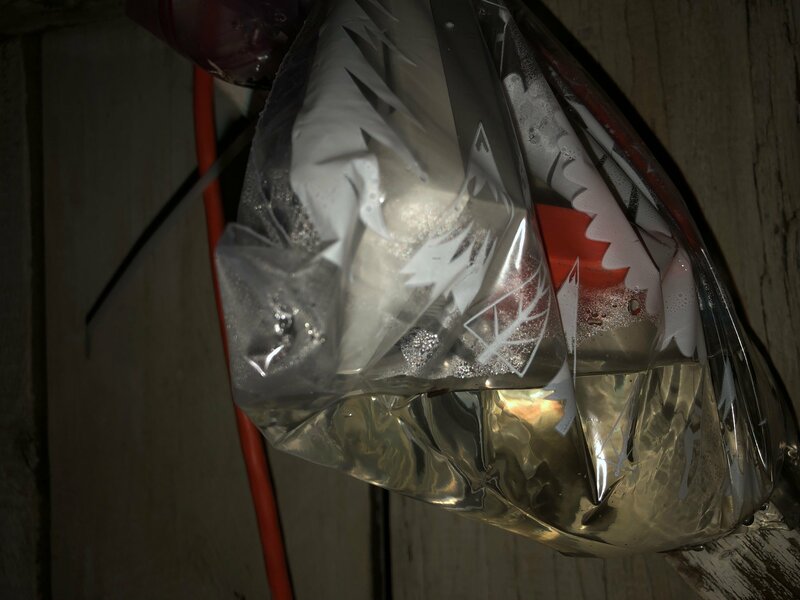 The lights on one end of the house were plugged into a power strip at the end of a long extension cord and that was the likely source of the failure. It’s pretty exposed to the elements, so I had wrapped it up in plastic and I thought it might be okay. When I got home and saw that the lights were out it was pouring, so I just checked to see if it had tripped a breaker at the main panel and taken out any of the other electrical circuits in the house. We were fine, so it must have just been the circuit breaker on the power strip – which is how it’s supposed to work. Tonight it was finally dry-ish, so I went out to see what was up, figuring a little bit of water might have squirreled it’s way in. Yeah, that’s a bag full of water and electricity. Not so good. The reality is that the electricity got cut off as soon as it hit the electricity on Tuesday and from there the water just kept coming in from wherever it came in and made it look really impressive now. Things are drying out now. We’ll see what’s working and what needs to be replace tomorrow.